Dual Oscillator Analog Pocket Synth - Korg's dual-oscillator Monotron DUO fits in your pocket, yet delivers enormous analog sound! Equipped with a built-in speaker and battery operation, Monotron DUO is ready - anytime, anyplace. Best of all, it's a blast to play, with a level of simplicity allowing anyone to enjoy the world of analog synthesizers. Product Block Copy Offering two oscillators, the monotron DUO adds an extra dimension of sound. Tune the oscillators in unison for a rich, thick, analog tone; in intervals for classic soloing sounds and generating new effects. 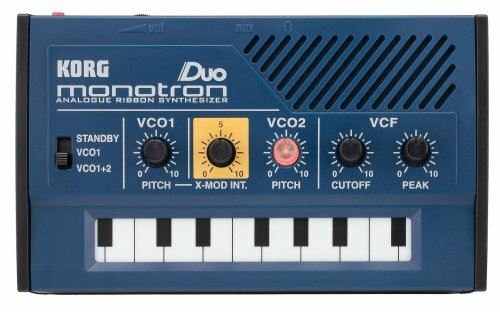 The X-MOD (cross modulation) circuit taken from Korg's classic Mono/Poly can introduce a mild or razor-sharp edge to the overall sound. The monotron DUO's ribbon controller keyboard features a Scale function to select one of four scales: Chromatic, Major, Minor, or Off. Choose the Chromatic scale to play precise pitches as on a piano, or choose Major or Minor to generate musically coherent phrases on the keyboard. View More In Electronic Keyboards.